Density is how much stuff is in a object or the mass per until volume. It is measured in kg/m^3. 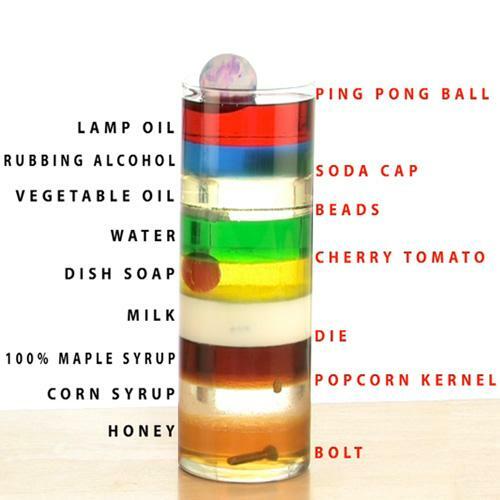 It is easy to calculate the density of an object: you just need to measure the mass and the volume. However, sometimes it can be tricky to work its volume. Less dense objects will float of more dense objects. Have a look at the picture on the right. 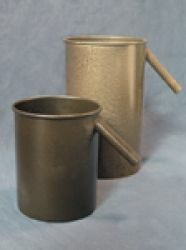 We can use a eureka can, shown on the left, to measure the volume of a non-uniformly shaped object. You fill the can to the spout with water and then drop the object in. The water level will rise by the same volume as the object and that much water will come out of the spout. Remember to be ready to collect it in a measuring cylinder! The Eureka can is named after the legend of Archimedes. It is said that the king had an irregularly shaped golden crown and he wanted to know how much gold was in it. He offered a great reward to the man clever enough to solve the problem. Archimedes was getting into the bath when he noticed that the water level rose. He jumped out of the bath shouting, "Eureka!"